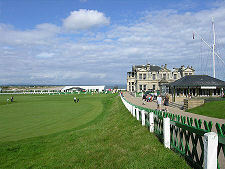 St Andrews in Fife is known throughout the world as the home of golf. As a result it is a place of pilgrimage for a steady stream of golf lovers who want to come and play on the many courses in the area. Or, still better, play on THE course: the Old Course at St Andrews, the course that has seen so many classic moments in Open Championships and other competitions. The 18th green and the 1st tee on the Old Course are overlooked by arguably the most important building in the world of golf, the Royal & Ancient Clubhouse. Those who are in St Andrews to play golf, or those just visiting the town who want to understand a little more about the game and its impact on Scotland, should look across the road that runs behind the R&A Clubhouse. Here you will see a low-lying stone building almost set into the embankment that rises behind it. This is the British Golf Museum, a superb museum that succeeds in bringing the game alive for the uninitiated, as well as feeding the addictions of those who thought themselves experts until venturing through its doors. 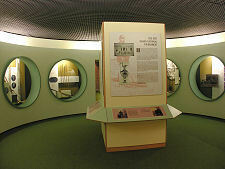 The story of the British Golf Museum started with a decision in 1864 of the Royal and Ancient Golf Club, to appoint a committee whose role was "to collect such articles relative to the game as they may think necessary and to make arrangements to render them accessible to members as may be consistent with their due preservation." 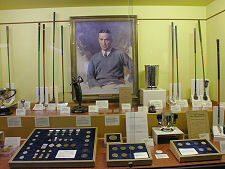 The R&A initially exhibited the collection that developed in the clubhouse itself, but by the 1960s it was becoming clear that the collection was becoming far too large for this to remain a viable solution. 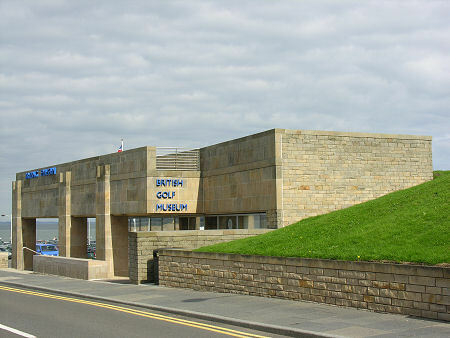 In 1985 the Royal and Ancient Golf Club decided to fund the building of the British Golf Museum, and set up a separate charitable trust to oversee the building of the museum and its subsequent operation. 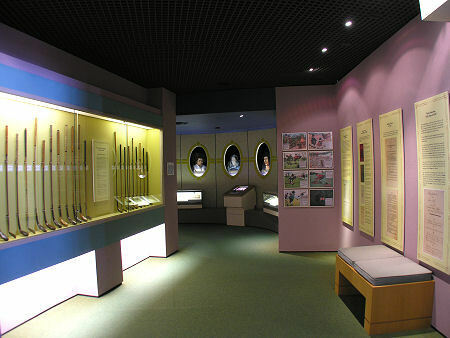 The British Golf Museum opened to the public on 25 June 1990 to great acclaim, and has since gone on to win a series of awards. It is one of only a small number of museums in Scotland to have been awarded the maximum 5 Star rating by the Scottish Tourist Board. The museum has not rested on its laurels. 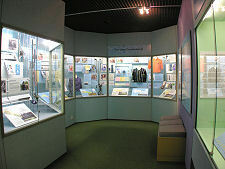 Each year since 1996 it has undertaken significant improvements, introducing new display areas or upgrading existing ones. 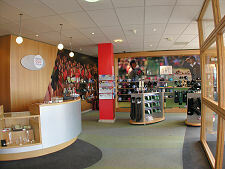 As a result its approach is bang up to date and highly interactive. 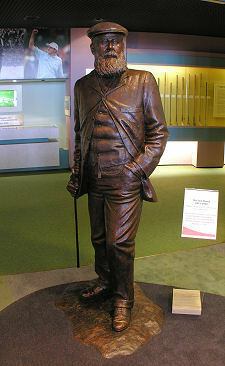 The first thing you see on entering the museum, apart from the expected reception area and shop, is the larger than life size bronze statue of Old Tom Morris standing at the entrance to the display areas. 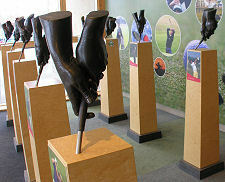 More subtle, but in many ways more evocative, are the collection of bronze grips of a series of golfing greats from Gary Player to Nick Faldo. Within the main display areas you follow a circuitous route that leads you through and past all the exhibits. These are divided chronologically into a series of exhibition areas from early golf through to the mid 19th century; before taking a more detailed look at the periods 1860-1885, 1885-1914, 1920-1945, and golf since 1946. You start with a look at the very early clubs and other equipment that have survived their apparent fragility and the intervening centuries, and an insight into some of the personalities, including most of the kings and queens of Scotland since James IV, who played the game. 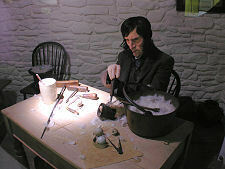 Especially thought provoking is the recreation of Allan Robertson's workshop, in which feather balls were made, by laboriously stuffing a very large quantity of feathers into a small leather case. It is tempting to suggest that balls at the time must have been far more expensive in relative terms than today: and that anyone losing one probably spent rather longer than five minutes looking for it! 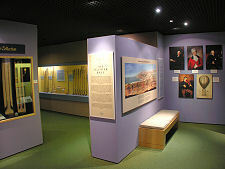 Elsewhere in the museum you can look at the oldest known set of golf clubs in the world, the Royal Troon Collection; you can admire the 122 amateur medals won by John Laidlay in the late 1800s and early 1900s; or, if you really want to, you can read minutes from the meetings of the Royal and Ancient Golf Club dating back to 1754 using a DVD display. The depth of the information available for those who wish to delve is remarkable. One gallery charts the Open Championship, taking visitors on a tour of all the venues and giving access to film and/or TV coverage of every one since 1923. 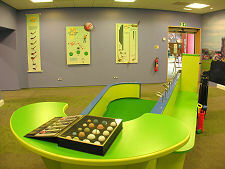 Staying very much at the hands-on end of things, the final exhibition area, "The 18th Hole", gives visitors the opportunity to practice their putting, using a variety of different eras of putter to hit a variety of different types of golf ball from across the ages: even a feather ball, though - understandably - anyone using one has to first fetch it from the reception desk.